Founded and built in 1924 by John D. Rockefeller Jr. and the Cleveland H. Dodge family, International House affords a unique experience in cross-cultural cooperation and understanding by nurturing leadership, moral courage, and empathy. Each year, more than 700 carefully selected graduate students and interns, from 100 countries, share a residential community and participate in leadership training and diverse intellectural and cultural programs. They study or train at more than 70 academic and professional institutions in New York in fields as varied as financial engineering, musical performance, historic preservation and public health. I-House residents learn essential skills to become future leaders in business, government, the arts and other professions. Information is available in the lobby at 500 Riverside Drive on weekdays from 9 am to 5 pm. Hailed as a Virtuoso and Intensely Soulful by the New York Times and Spellbinding by the New Yorker, and Incredibly Rich Sound by the CBC, Kinan Azmeh is one of Syria's rising stars. His utterly distinctive sound across different musical genres is now fast gaining international recognition. Born in Damascus, Kinan was the first Arab to win the premier prize at the 1997 Nicolai Rubinstein International Competition, Moscow. He has appeared as soloist with the Bavarian radio orchestra, the West-Eastern Divan Orchestra, the NDR big-band, the Kiev Camerata, the Knights Orchestra, the Izmir State Opera Orchestra, the Corasara Orchestra, the Osnabruck Symphony, the Morgenland Festival Orchestra, the Qatar Philharmonic , the New Juilliard Ensemble and the Syrian Symphony Orchestra among others, and has shared the stage with Yo-Yo Ma, Marcel Khalife, Aynur, Daniel Barenboim, Jivan Gasparian, Zakir Hussein Francois Rabbath, Simon Shaheen, Solhi-al-Wadi, Calefax Reed Quintet, and members of the Berlin Philharmonic Orchestra, among others. [post_content] => “The Body Works” is an act of affirmation and self-care. It is also a workshop series that scaffolds up in each of eight two-hour classes. Sessions brim with dance, movement, and gut-tickling tales of the mind-body connection that are bound to inspire participants to eat, sleep, and play well with others to a more satisfying end. The gurus of wellness who enjoin the body to work and embody lifetime skills that reallywork are Alvin Ailey emeritus and dance icon, Ms. Renee Robinson, and Ailey Dance Company’s manifestly talented physical therapist, Dr. Sheyi Ojofeitimi. Attend one class or more. $360 value. Free for I-House residents. RSVP required. Cancellation fee of $45 per class without notice or substitute – donated to I-House scholarship fund. Class size 25-30. First come, first served. Wear comfortable clothes and sneakers. Beginners welcome! Sponsored by International House New York Global Health and Wellness Services (The GWB). Interested in attending? Sign up via the Eventbrite link! [post_content] => What is All Nations? All Nations is the BIGGEST event of the year that celebrates the many cultures, talents and interests of our unique and rich community! This annual celebration is an important fundraiser for the scholarship fund, but most of all it is the best time to interact with all the resident members in a cheerful, inclusive and stress-free atmosphere! All Nations is a night that brings hundreds of residents, staff and guests together to celebrate and showcase culture and diversity in many different creative ways! The night commences at7:00 p.m. with residents taking us on a journey around the world through the International Food/Cultural Festival, a Grand Salon Night, International Dessert Stations, followed by an INCREDIBLE DANCE PARTY that ends at 3:00 a.m.! View pictures from the 2018 All Nations Celebration HERE! 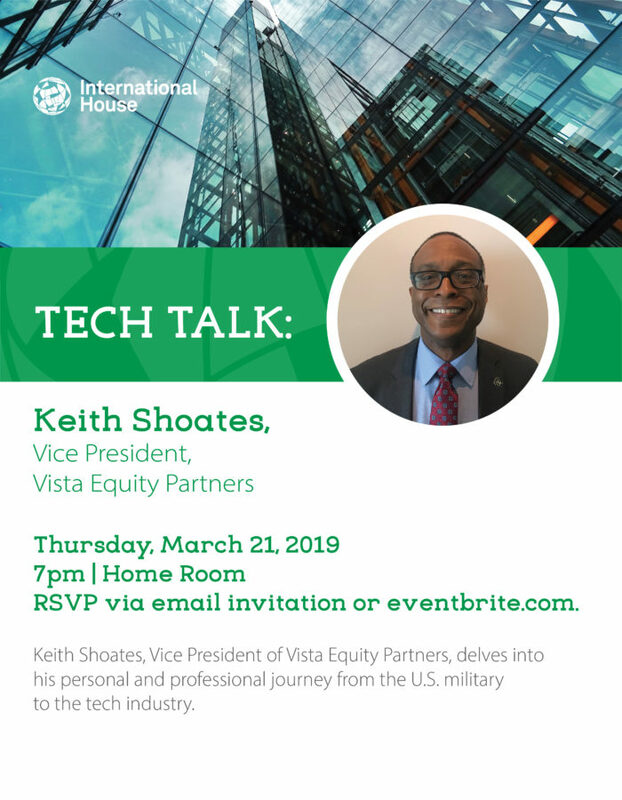 [post_content] => Please join us as Keith Shaotes, Vice President of Vista Equity Partners, delves into his personal and professional journey from the U.S. military to the tech industry. BIO: Mr. Shoates is responsible for integrating strategic planning, operations, corporate communications, and corporate initiatives in support of the firm’s Chairman and Chief Executive Officer, Robert F. Smith. Prior to joining Vista, Mr. Shoates worked as a Director at Integrity Applications Incorporated (IAI), where he built the firm’s portfolio in Northern Virginia. His primary focus was delivery of enterprise information technology solutions for federal agencies of the United States government, with an emphasis on the Department of Defense and the Intelligence Community. Before joining IAI, Mr. Shoates served 24 years in the United States Air Force as an acquisition and project management specialist for information technology, satellite, communications, and command and control systems before retiring in 2011 at the rank of colonel. 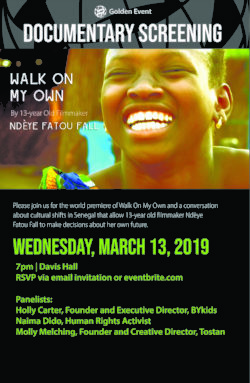 [post_content] => Please join us for the world premiere of Walk On My Own and a conversation about cultural shifts in Senegal that allow 13-year old filmmaker Ndèye Fatou Fall to make decisions about her own future. Synopsis: In her film, 13-year-old Ndèye Fatou Fall tells how her life has been affected by profound changes that occurred in her village a few years before she was born. In 1998, Keur Simbara, Senegal was among the first communities to publicly abandon the traditions of Female Genital Cutting (FGC) and child marriage, traditions which had been practiced for centuries. More than 700 million women living today were married as children and FGC has impacted an estimated 200 million girls and women in 30 countries worldwide. Mentored by Emmy-winning filmmaker, Elizabeth Hummer, Ndèye Fatou takes us on the journey of a cultural shift which fundamentally changed the course of her life and those of her peers. We learn how the women of Keur Simbara and the surrounding villages were inspired by the teachings of Tostan, a human rights non-profit based in Senegal, and how they, with the help of their Imam, were able to change deeply entrenched social norms. Panelists: Holly Carter, Founder and Executive Director, BYkids; Naima Dido, Human Rights Activist: Molly Melching, Founder and Creative Director, Tostan.